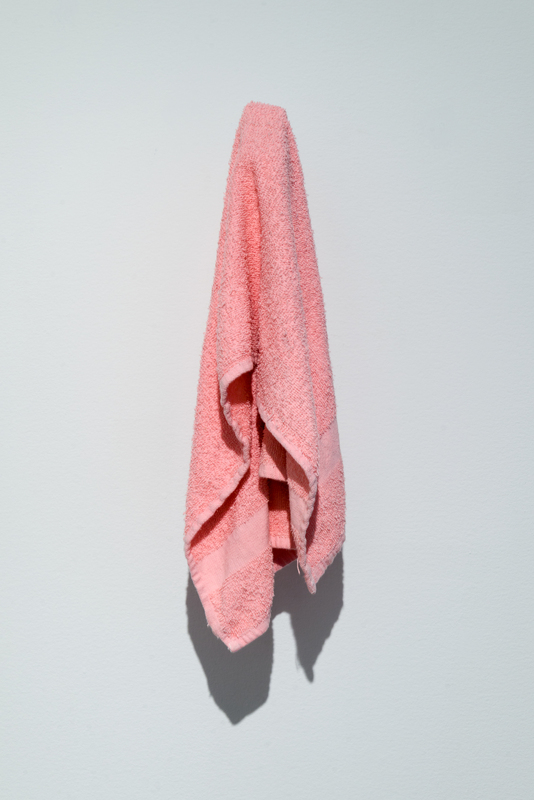 Prisoner Towel, 2016 Pink Cotton towel 16 x 7 x 8 *This pink towel is an artifact collected during the research phase of “Esta Tierra Es Tu Tierra". Found object taken from “Tent City Jail” formerly located in Maricopa County, Arizona. 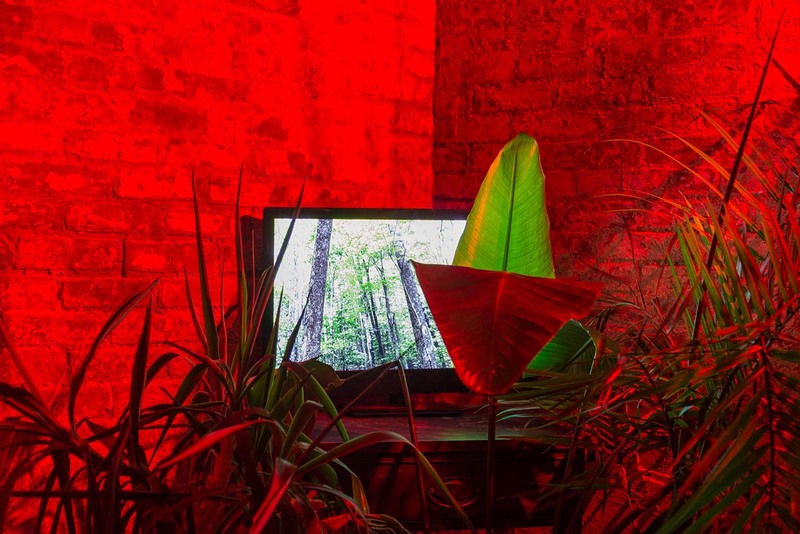 Disconnect to Reconnect (The hidden and unseen), 2017 Moving image on flat screen installed with assorted plants, and red light. dimensions vary according to space. 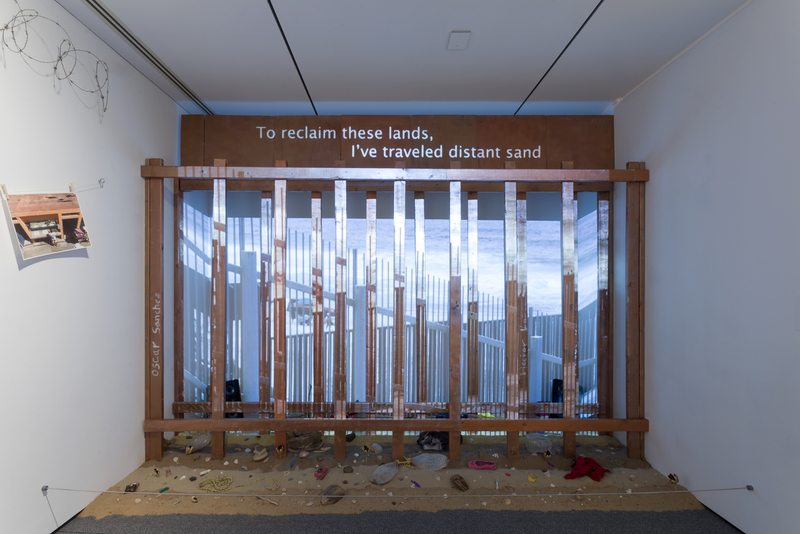 Esta Tierra Es Tu Tierra (This Land, Is Your Land) is an on-going immersive multimedia installation focusing on the US-Mexican border and the lives it affects. 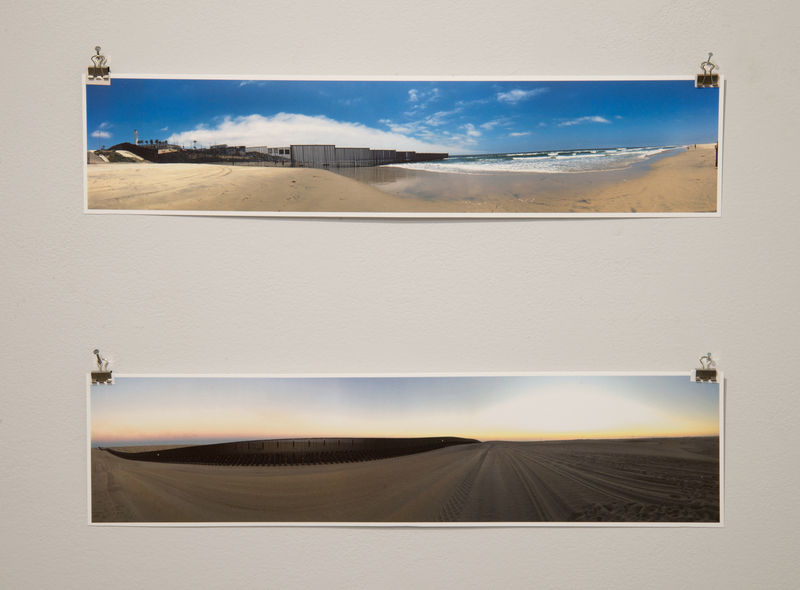 The preview exhibition held at The Baltimore Museum of Art in June 2018 featured research data in the form of moving images, photography and found objects gathered from the border itself, spanning its entirety; from the Gulf of Mexico to the Pacific. 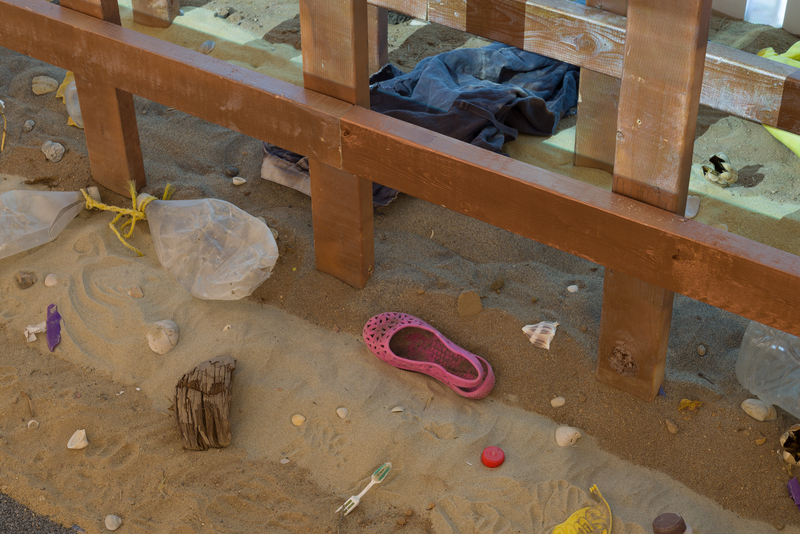 Research and materials were gathered by Erick Antonio Benitez in the Winter 2015 & Summer 2016 by traveling to numerous border sites along the S. West of the US and Mexico. 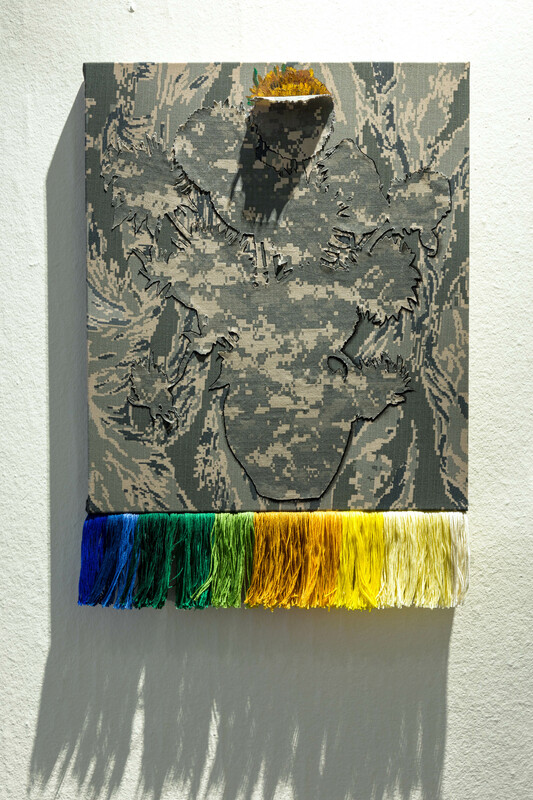 Esta Tierra aspires to capture and depict the implications of a border by simulating the experience of its cold and brute physicality. In replicating just a portion of such a structure in a part of our country so geographically removed from the actual place and real events, perhaps we can lead people to consider the threads between one’s comfort and another struggle, from the personal to the global. Education and empathy are key to understanding the history of such intersections and conflicts, the reasoning behind leaving one’s home country/original conditions and the risks in journeying to a foreign land, or desire to defend your own country from unknown change. 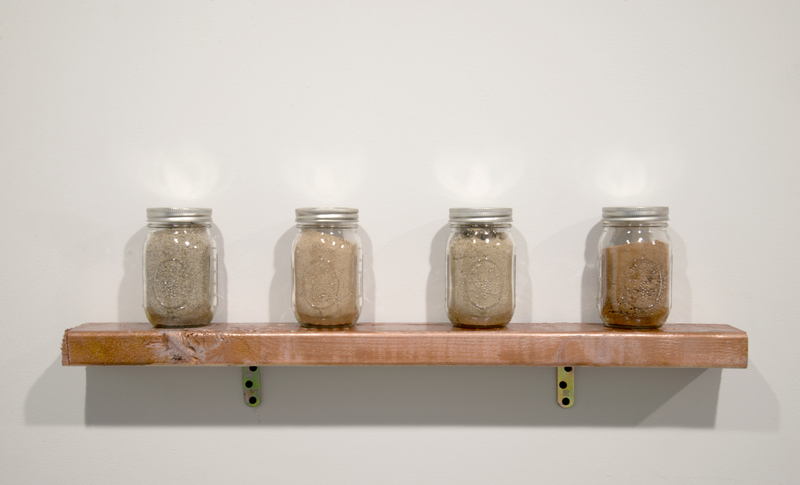 A work of the scale of Esta Tierra Es Tu Tierra creates the time-space for the growth of the mind and insight through simulated experience into situations viewers may otherwise never know or critically and compassionately consider. 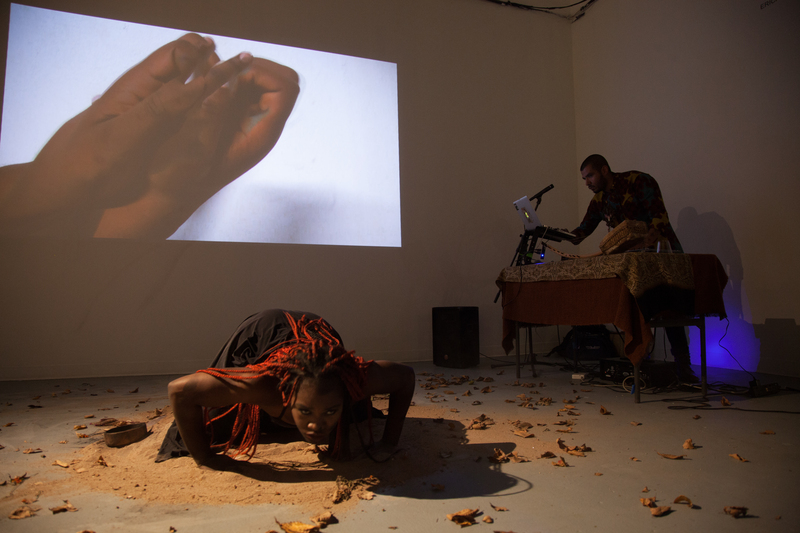 This project was awarded the 2016 Ruby Artist Project Grant, sponsored by the Greater Baltimore Cultural Alliance, which allowed funding for its in-depth investigation and early development stages. 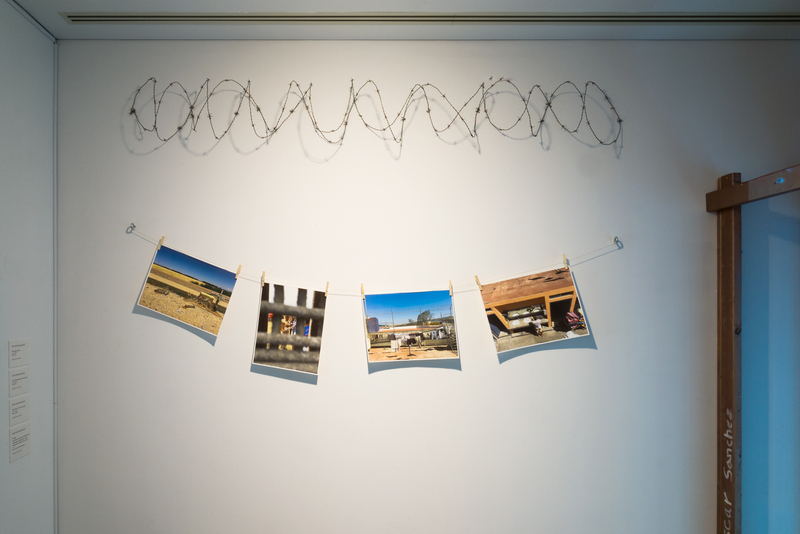 Ideally, Esta Tierra Es Tu Tierra will be a traveling - touring exhibition with the intention of reaching a wide and diverse audience all through the United States of America. “Prisoner Tower”, 2018 Pink Cotton towel 16 x 7 x 8 *This pink towel is an artifact collected during the research phase of “Esta Tierra Es Tu Tierra”. Found object taken from “Tent City Jail” formerly located in Maricopa County, Arizona. Esta Tierra Es Tu Tierra ( This Land Is Your Land) , 2016 - On-going Multimedia : Video projection, spray paint on wood, foam core, soundscapes, assorted sand and dirt from various border sites, found clothing articles and belongings, yucca flowers, seashells and candles. 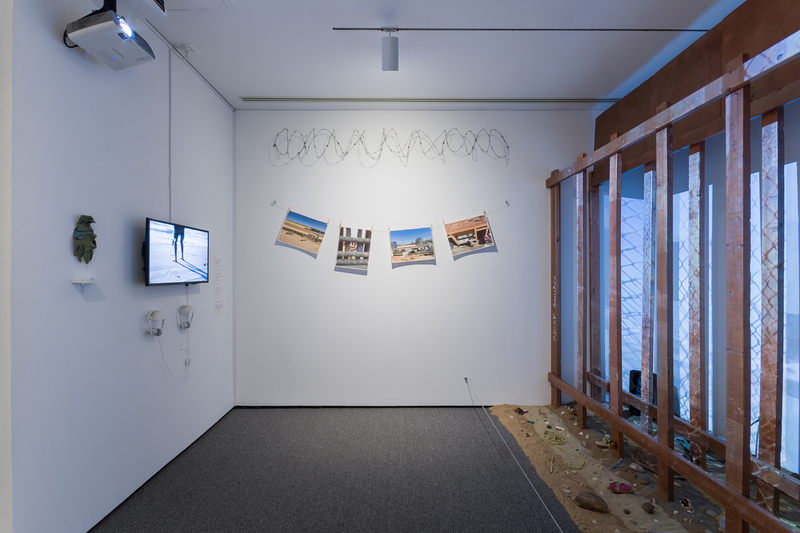 Dimension vary according to space *Installation view at The Baltimore Museum of Art *Esta Tierra Es Tu Tierra (This Land, Is Your Land) is an on-going immersive multimedia installation focusing on the US-Mexican border and the lives it affects. 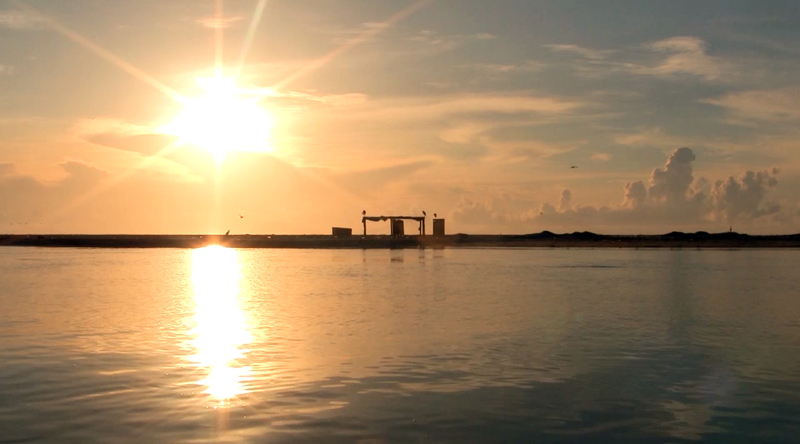 This video works are sample excerpts part of Esta Tierra Es Tu Tierra. 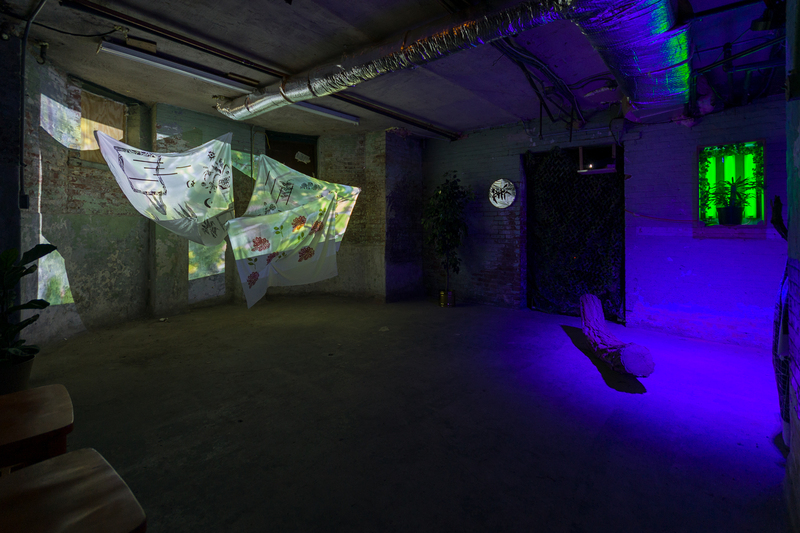 These video works were projected on the border wall sculpture. 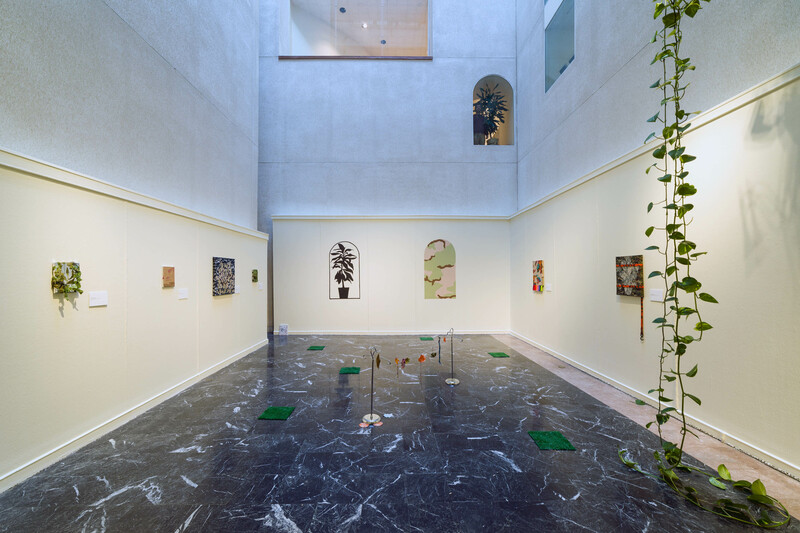 Excerpt from Documentary of "Esta Tierra Es Tu Tierra"
A City of Magic Carpets is an exhibition exploring an imaginative place between interior and exterior landscapes through the language of painting, textiles, and tactile materials. 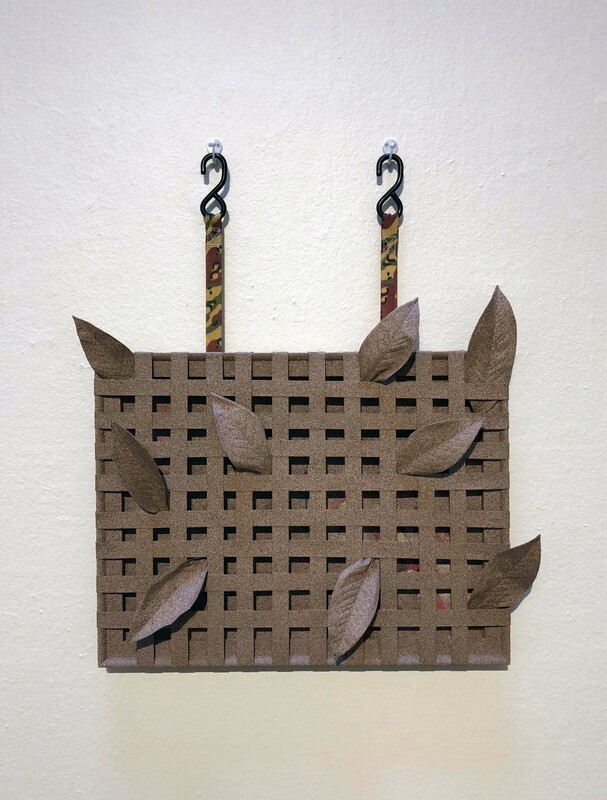 Motifs of nature, fashion, and objects found within interior spaces are references used to reinvent ways of seeing material and the weight it carries. 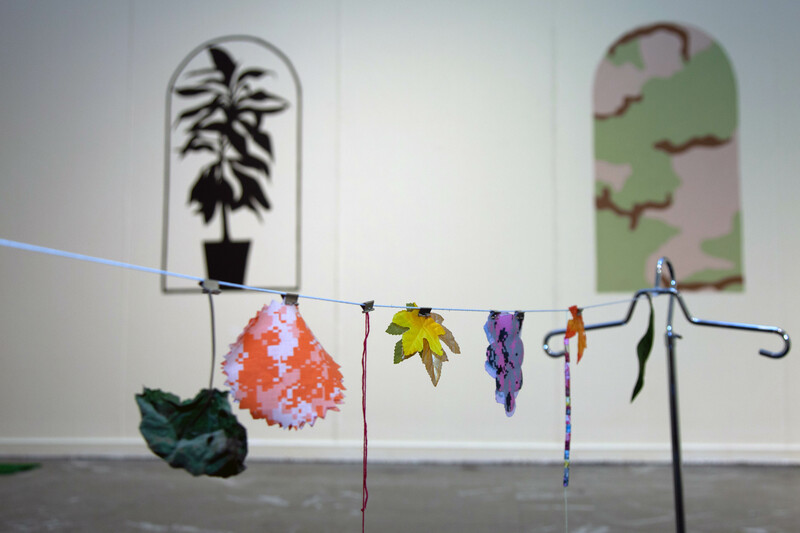 A City of Magic Carpets explores the nuances of materiality through its relation with the human body and its figurative connection with surrounding landscapes. 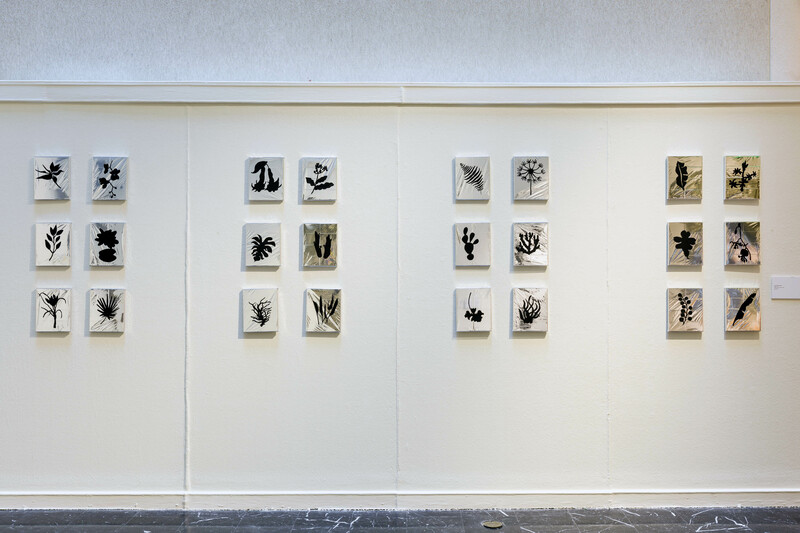 Drawing inspiration from the audio poem, The Bristol Project by Vito Acconci, this work examines a parallel connection of imagery and non-fictional worlds intersecting one another into abstractions and visual metaphors. The line, “Now it's the land itself here who is a body, a body of land, it's the water itself that's a body of water,” expresses the notion of imagery we understand outside of its common context. 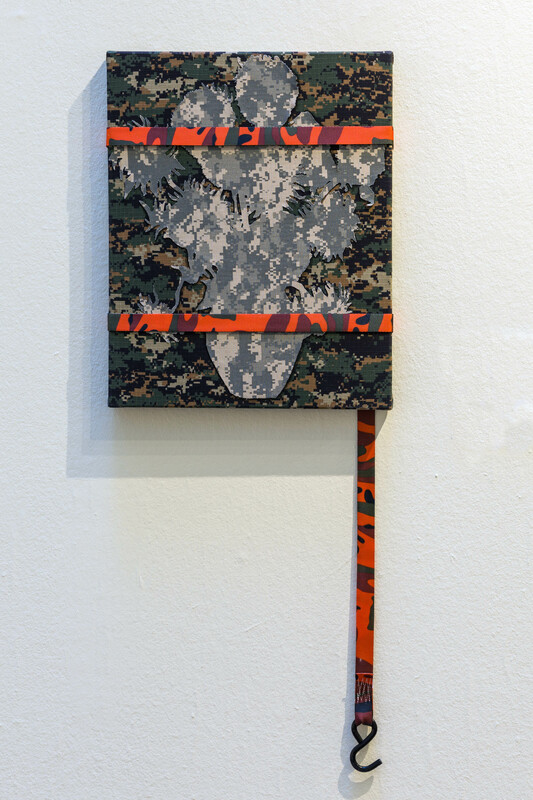 Like Acconci’s word play, the textile paintings found in this work are constantly reinterpreted and reimagined outside of it’s ordinary function. 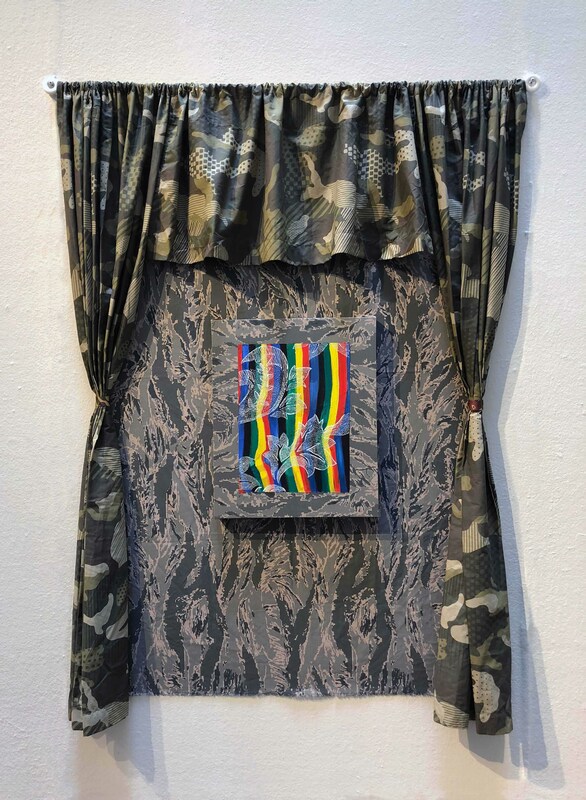 Through the use of camouflage textiles, floral embroidery imagery and thermal mylar blankets, A City of Magic Carpets opens a metaphysical dialogue to dissolve and reexamine our understanding of landscape. 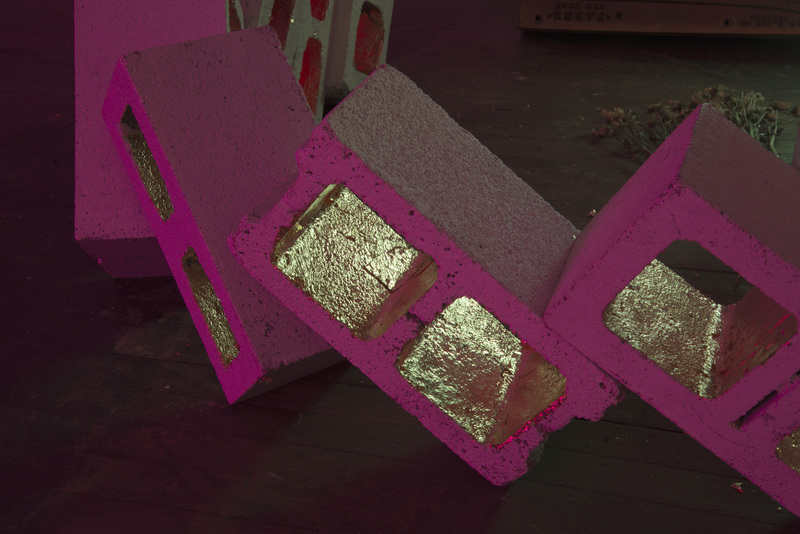 The way the material transcends past it’s psychological associations, gives new perspective on how one can interpret the concept of landscape outside of the common human experience. 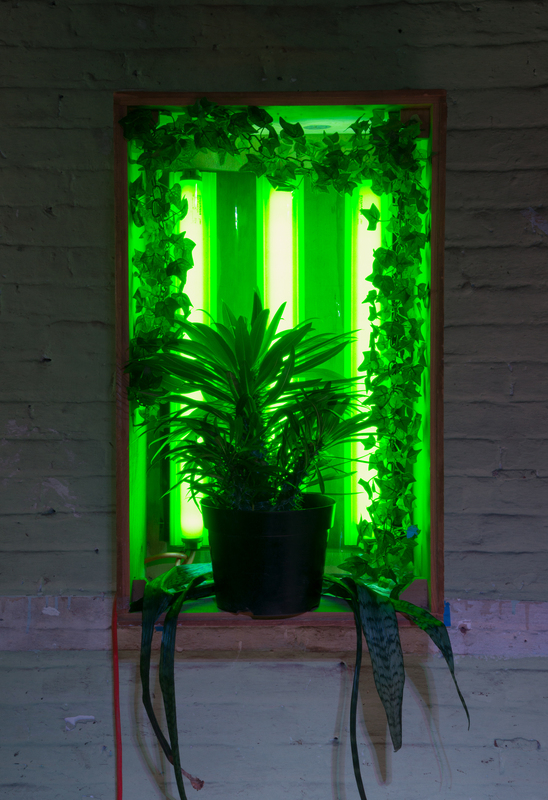 Working together in collaboration, Ariel Foster and Erick Antonio Benitez create a multimedia installation focusing on the exploration of nature and its integration with man-made environments. 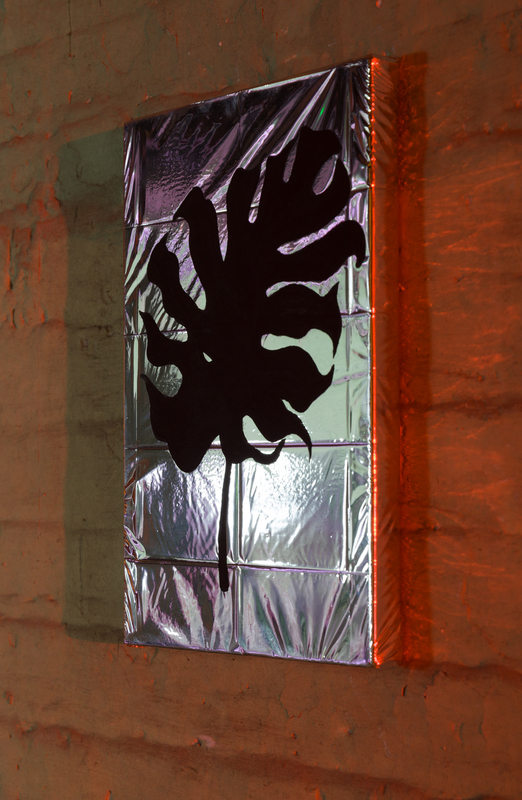 Using projections, soundscapes, light-sculptures, plants and fabricated tapestries from linocuts, Plant·sa·tion invites the viewer to reflect and examine its relation with the natural world in our own personal spaces, whether it be through the lens of technology, fashion, design, interior and exterior landscapes, and our day to day relationship with nature from food, medicine, and knowledge. 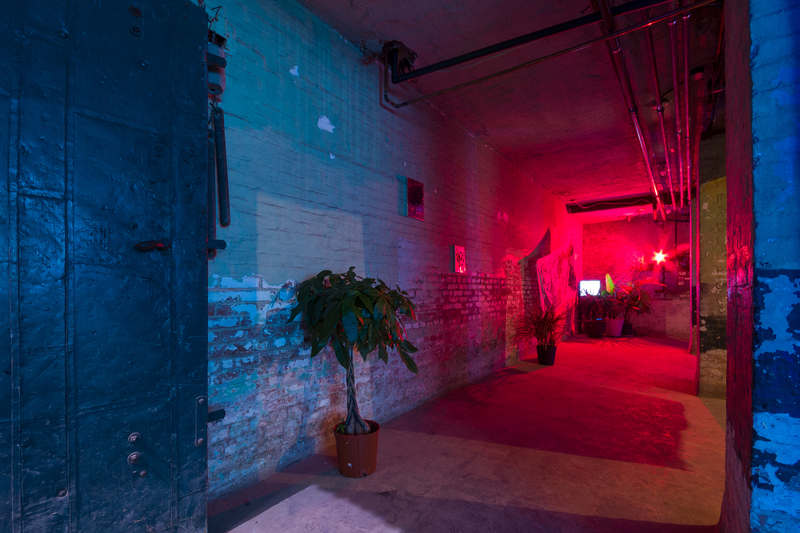 El Palacio Del Sol is a nomadic pop-up space located in the cellar of a historical mansion in the heart of Reservoir Hill. 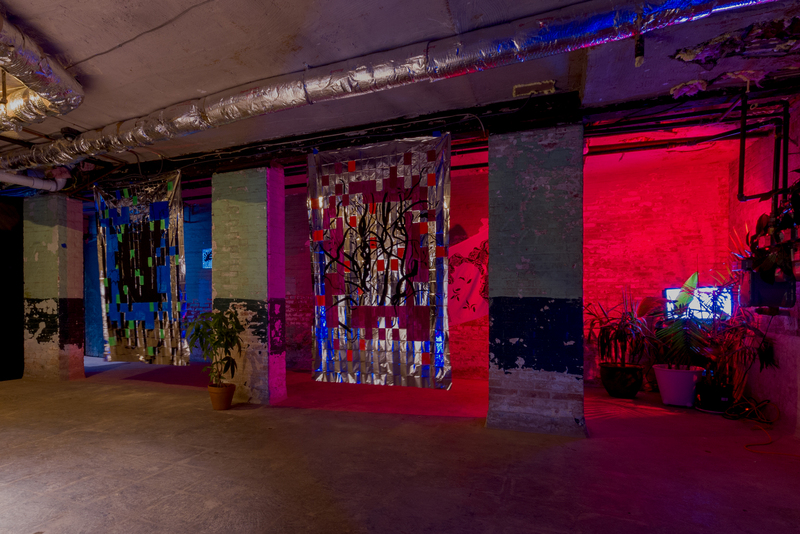 In the past 5 years, this 200-year-old building has been rehabilitated and this is the first event to set off the space’s mission to showcase site-specific work that pushes the boundaries of a conventional gallery setting. 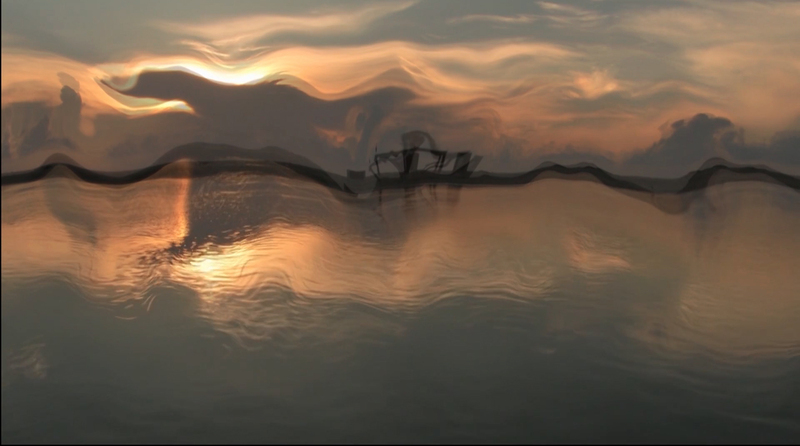 Sensations of the Earth, 2017 Moving Image and Sound dimensions vary Moving Image and Sound ( samples that were projected on the Linocut Tapestries) All images are authentic video footage captured during various travels instances in Brazil, Chile, Colombia, Costa Rica, and the Shenandoah mountains. All sounds are part of an original composition composed from field recordings (from various nature locations) and electro acoustic processed audio. 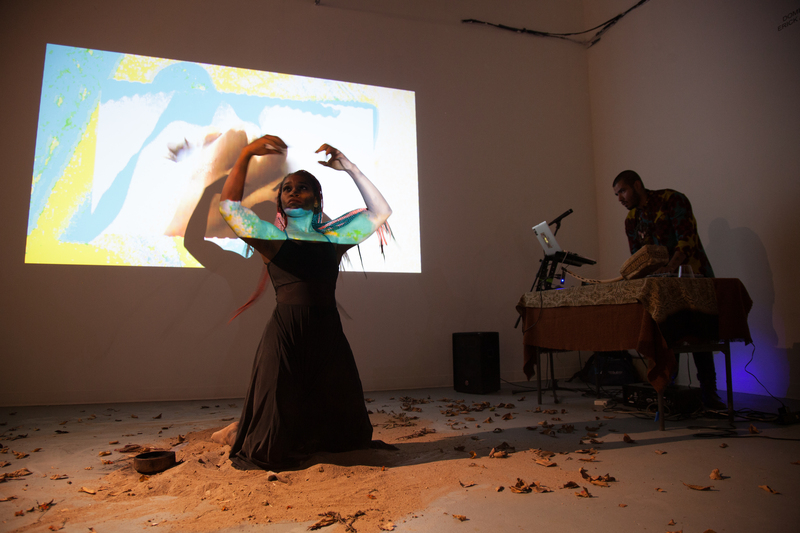 Eroica is collaborative multimedia installation and performance piece by the dancer Neeka Reeves and multidisciplinary artist Erick Antonio Benitez. 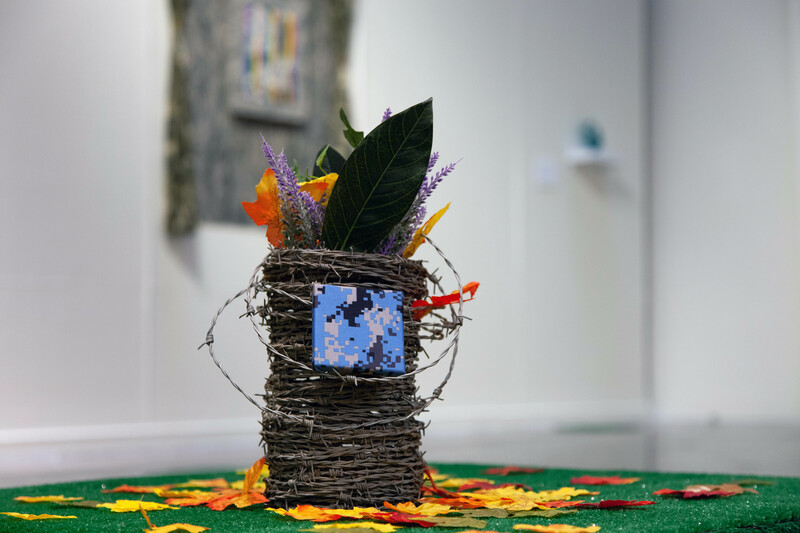 Eroica is a work intended to examine the boundaries and struggles faced by African American women in modern-day America and how these circumstances translate into a search and longing for freedom through the exploration of origins and roots. Using symbols of nature and movement, Eroica suggests and explores the ideas of self-empowerment and myth. To create freedom where it was not given, to find freedom where it was lost, to manifest freedom, where it was forgotten, are all questions that Eroica invites the viewer to reflect upon. Eroica presents a narrative of a African American women who faces the day to day challenges being marginalized by the color of her skin and gender. A voice that has been silenced by this outcome is expressed through a metamorphosis of the inner voice. Through the channeling of ritual and dance, the inner voice is capable of transcending the individual into a place of freedom. Ultimately Eroica evokes a myth of freedom that liberates an oppressed individual. 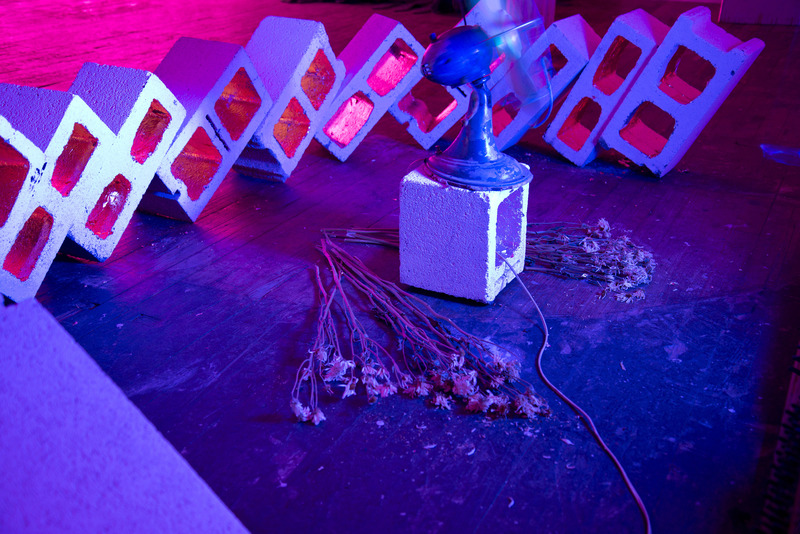 The installation and performance of Eroica is composed of movement, sound performance and a visual installation made of video projections and found objects. The performance element of Eroica is a call and response between the dancer and musician through a method of improvisation with a loose choreographed structure. 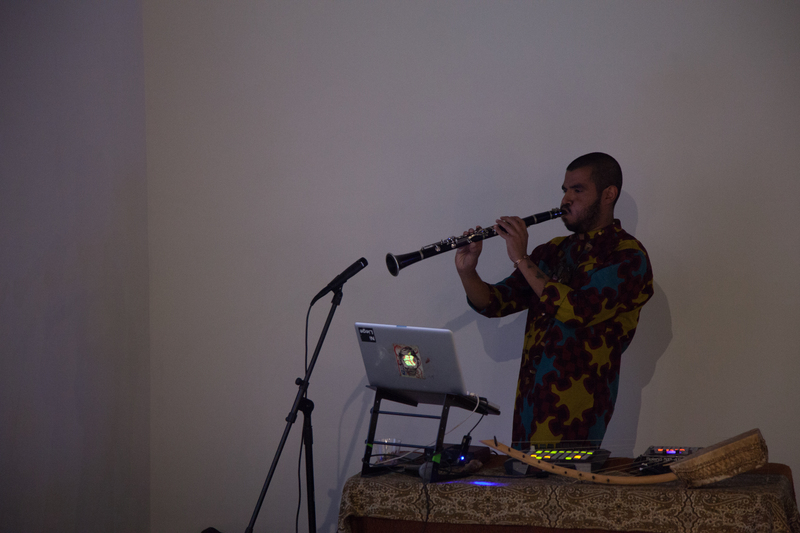 The musician creates compositions with field recordings, acoustic and electronic instruments. 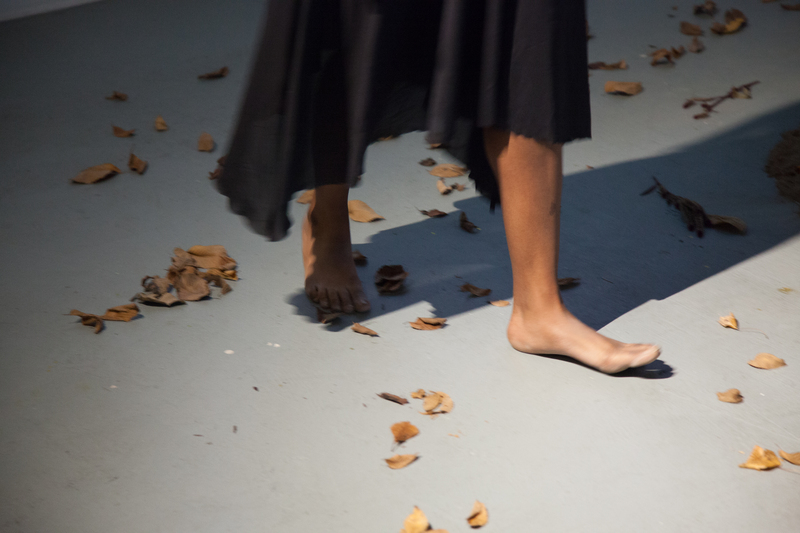 The dancer's role includes dialogue, dance, and interaction with the visual installation. 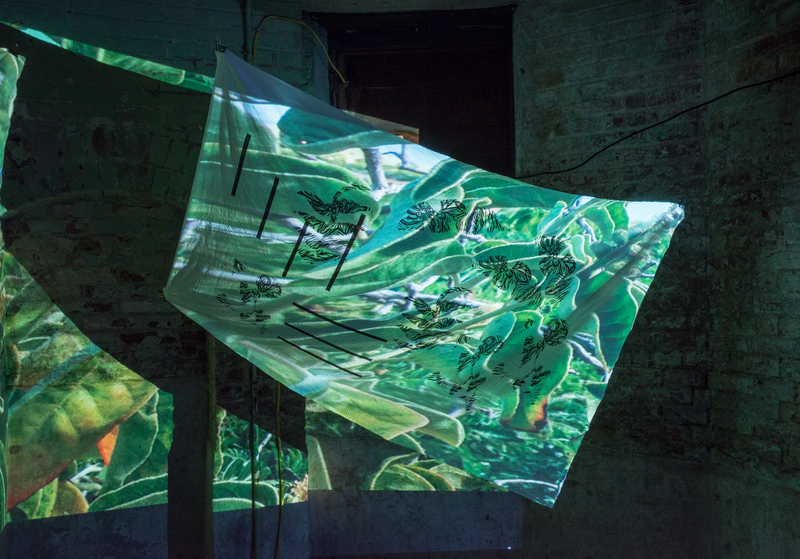 The visual installation includes a projection within the space of the performance to fabricate symbols and visual cues that amplifies the narrative of Eroica. 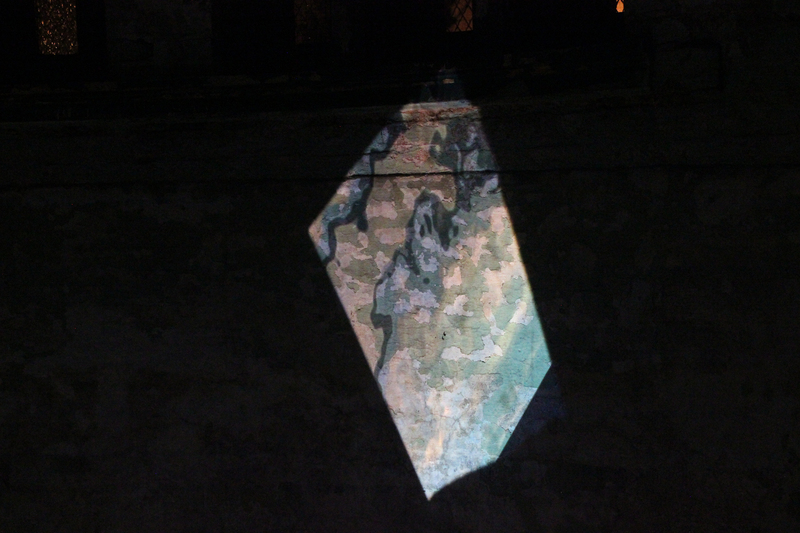 These projections culminate images found in nature, city infrastructures and symbols. 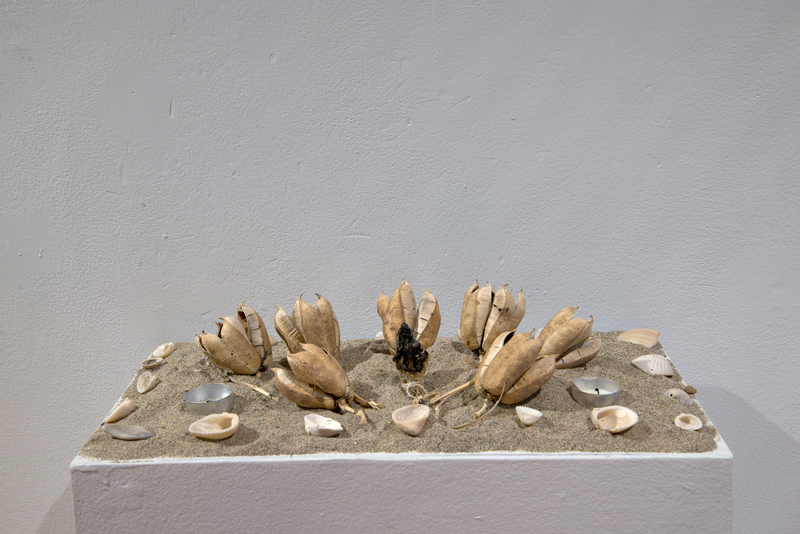 To complement the visual aesthetic, an installation of physical natural found objects is installed to enhance the ritual elements of the movements found in Eroica. 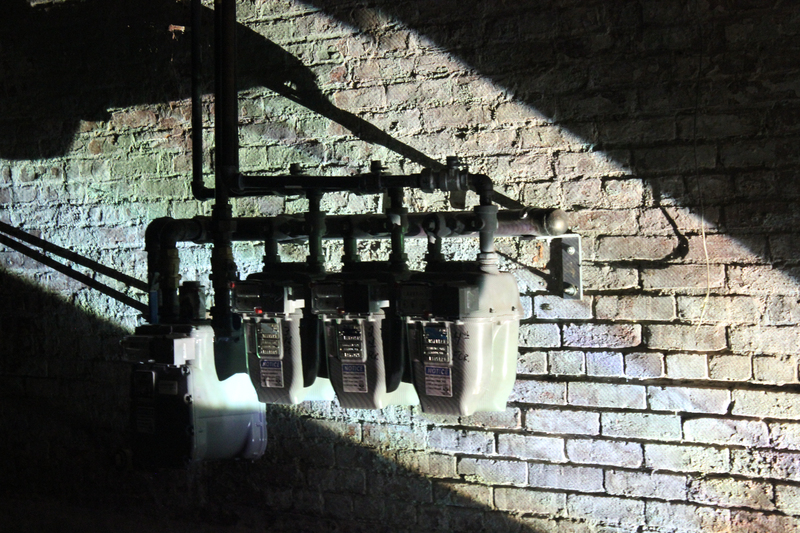 Eroica will also be developing into a short film musical narrative using the similar themes from installation/performance such as dance choreography and music with scenes taking place in numerous locations around the city of Baltimore. This short film project will initiate in Spring 2018. 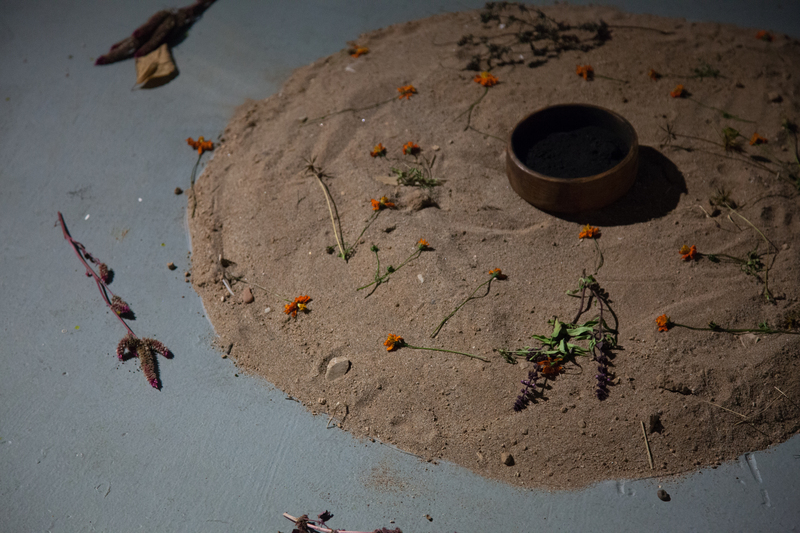 Installation/Performance view, 2017 projection, sound, sand and assorted flowers native to Baltimore. 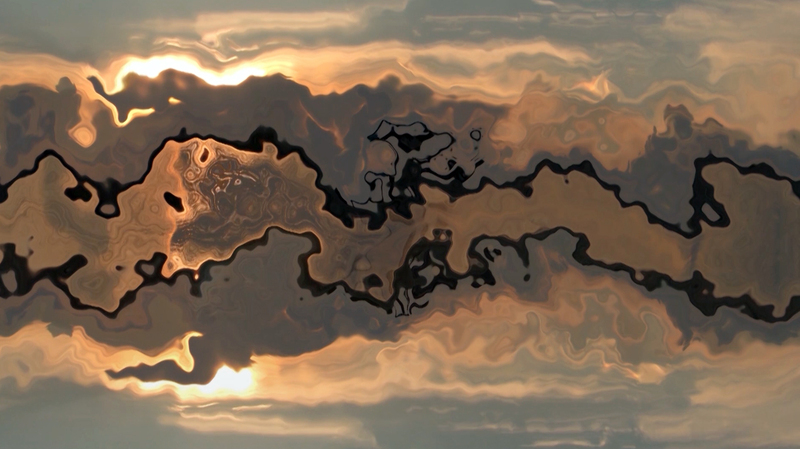 This video work is conceptually inspired by the idea of building a meditative connection and experience with the presence of the sun and it's co-existing role with our planet The images depicted from this video were captured from a sunrise that took place at the Gulf of Mexico ( between the border of Mexico and the US). 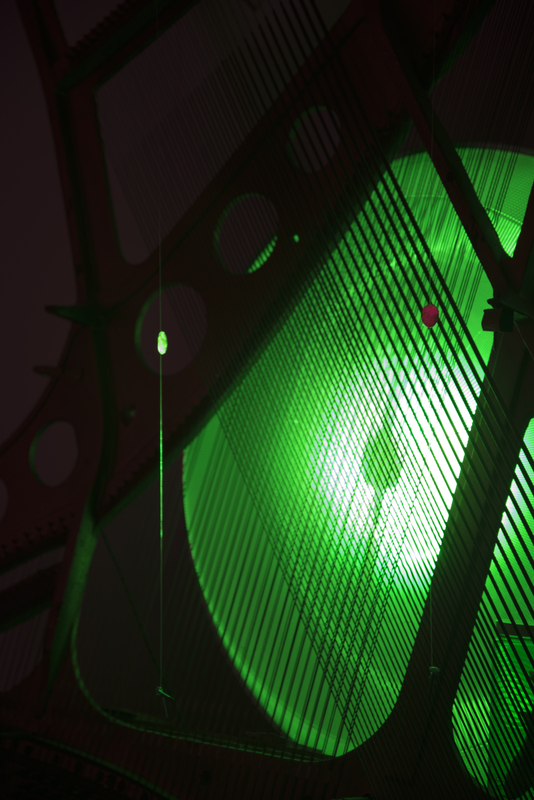 In contrast to the moving images, the piece includes original sound composition composed of on-site field recordings, acoustic instruments, electronic sound designs and wav files from NASA (recorded light waves of the sun by a satellite, then transcribed in to sound waves). 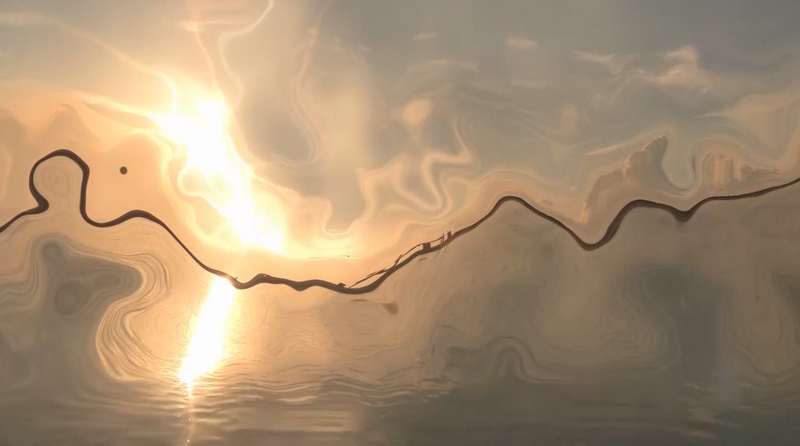 Rito del Sol (Excerpt), 2016 Moving Image and Sound This video work is conceptually inspired by the idea of building a meditative connection and experience with the presence of the sun and it's co-existing role with our planet The images depicted from this video were captured from a sunrise that took place at the Gulf of Mexico ( between the border of Mexico and the US). 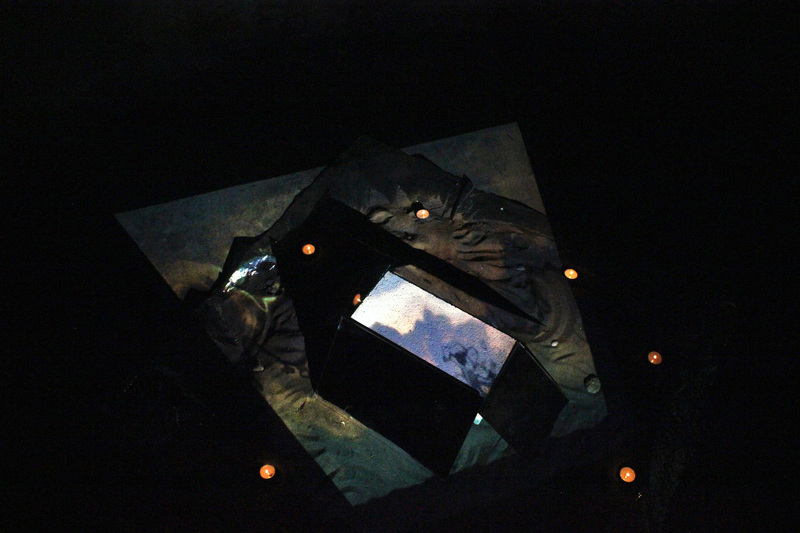 Installation: Projection, Mirrors (4), Sand, Candles, Aquarium with Water, and soundscapes composed of field recordings, acoustic instruments, and sound samples of lights rays transcribed to sound waves by NASA. 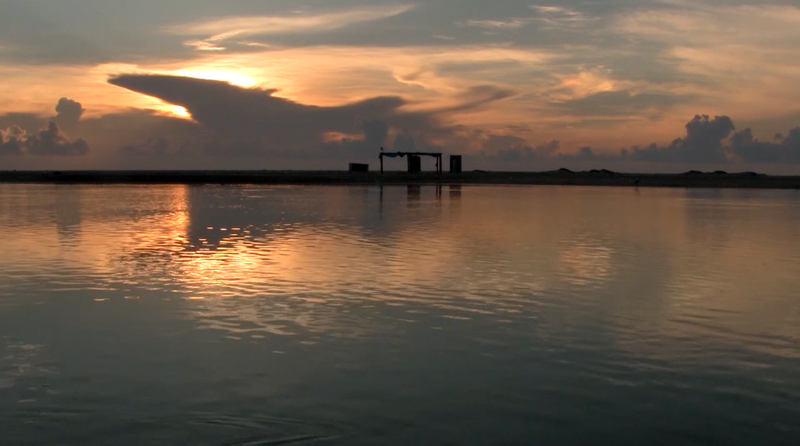 This video-sound installtion work is conceptually inspired by the idea of building a meditative connection and experience with the presence of the sun and it's co-existing role with our planet The images depicted from this video were captured from a sunrise that took place at the Gulf of Mexico ( between the border of Mexico and the US). 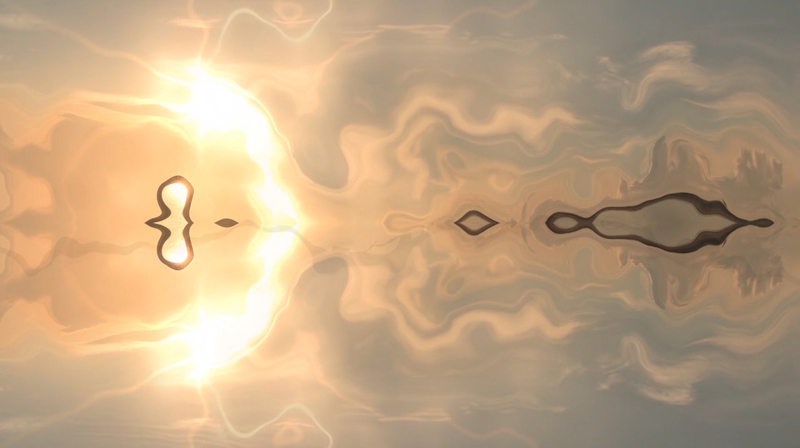 In contrast to the moving images, the piece includes original sound composition composed of on-site field recordings, acoustic instruments, electronic sound designs and wav files from NASA (recorded light waves of the sun by a satellite, then transcribed in to sound waves). This is a compilation of recent sound compositions that incorporate field recordings from various site-specific natural locations such as Costa Rica, Colombia, Chile, Mexico, S. West US, Baltimore (MD) and the Shenandoah region. 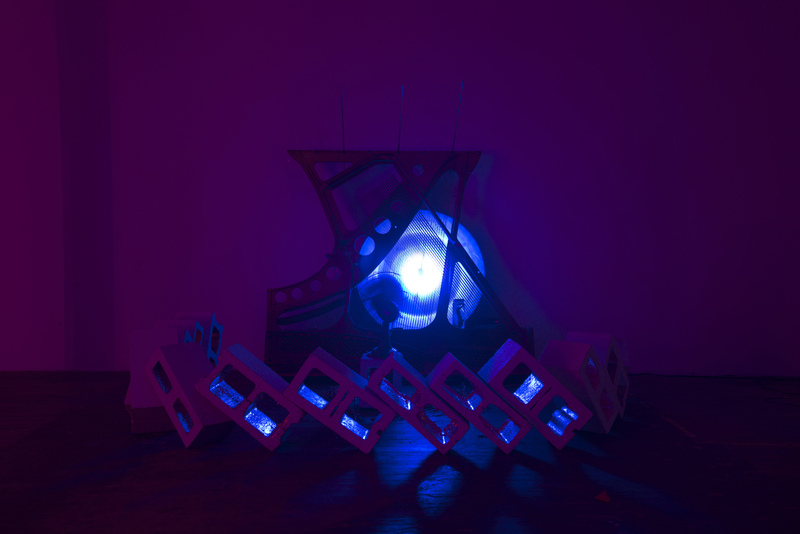 These sound pieces also include acoustic instruments processed and altered with electronic software mixed in. Eroica I, 2017 Sound This is sound sample from original composition (20:00 min) of Eroica Performance/Installation work. 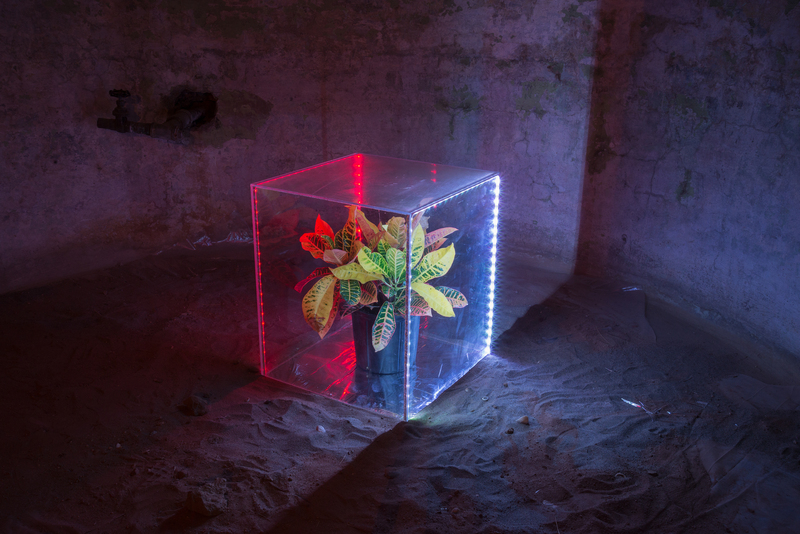 This work features field recording and electro acoustic processed audio with live instruments. Anamorphosis, 2017 Sound This is sound sample from original composition (20:00 min) of Eroica Performance/Installation work.This work features field recording and electro acoustic processed audio with live instruments. 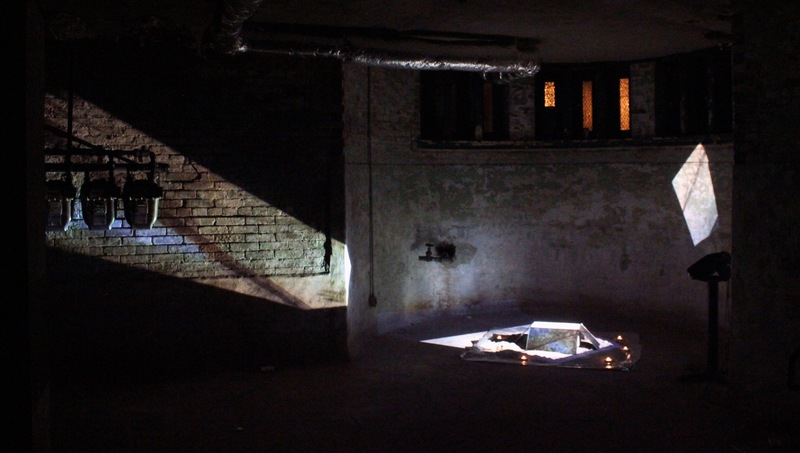 Light Chambers, 2015 Sound Composition for a collaborative performance piece titled “Transcendence”, which consists of sound and movement artist. 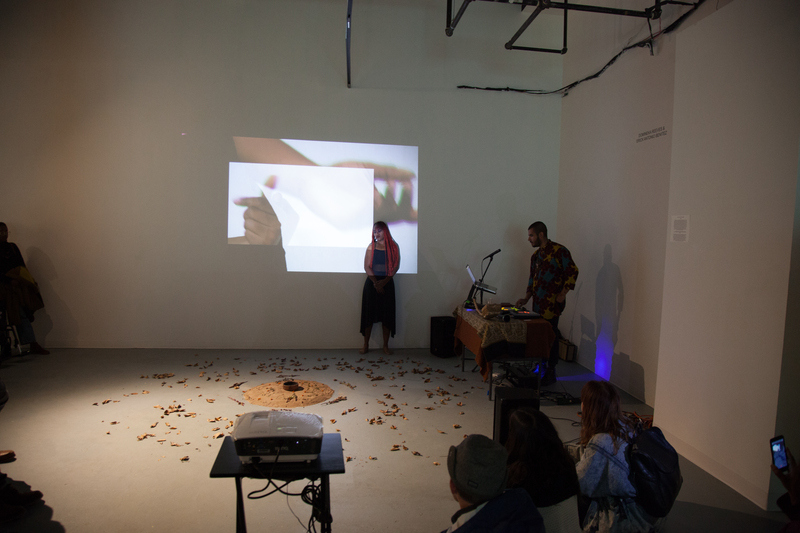 Sound is composed of processed drums, electronics, Peruvian sheep nails, and violin. Teorias (Theory), 2017 Sound Intro track to an experimental mixtape composed of field recordings, processed instruments and samples. This project was inspired by Hip-Hop, Myth, Kung-Fu, and Redemption. Rio Palomino, 2017 Sound composition contains field recordings of the Chilean Airport (Santiago), Sierra Nevada (Colombia) and electro acoustic processes sounds on Ableton. Egyptian Temple, 2017 Part of collaborative group project called Tropical Mercury. Band consists of Cello, Bass, Electronics, Keyboards, Processed drums and Vocals. Between now and then, 2016 Collaborative music project by Tropical Mercury. Group consist of Cello, Bass, Electronics, Keyboards, Processed drums, and vocals. Recorded at Peabody Studios. 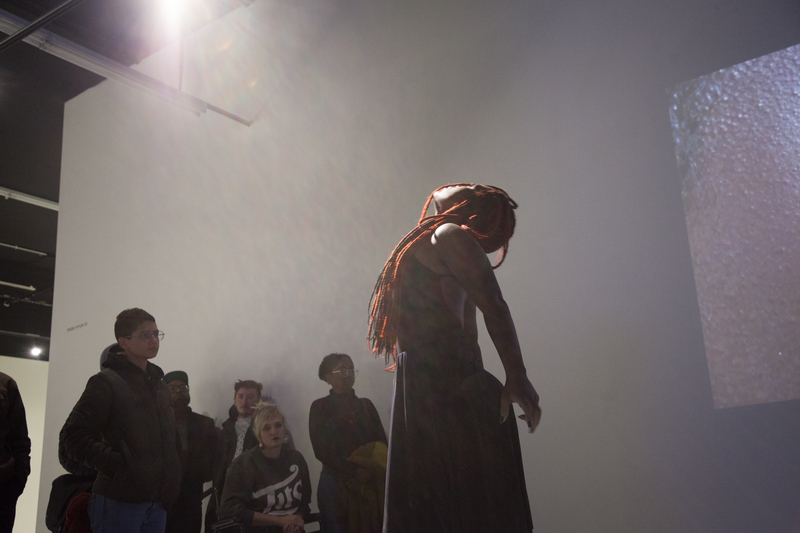 The Art+Is(t) Being: Anamorphosis is a performance examining the concept of artistry in relation to modern society in the physical and digital realms. 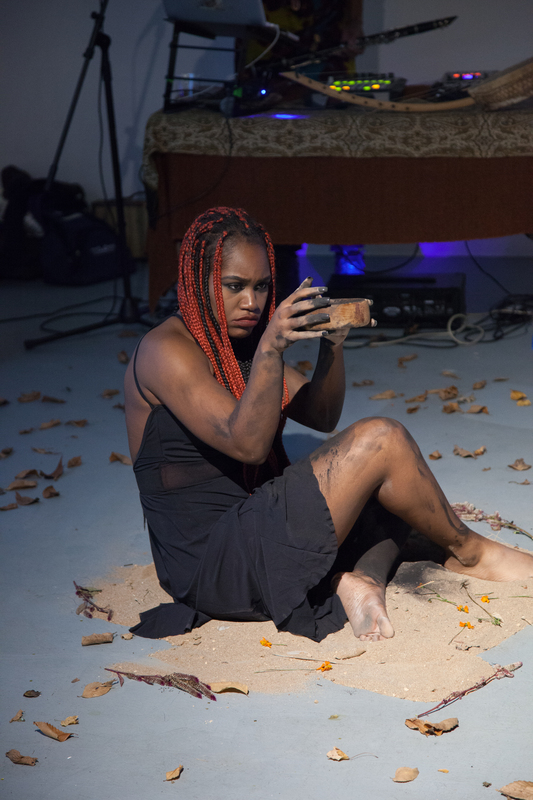 This performance culminates into a metamorphosis, expressing the transformation of a creative vision, but also creating a dialogue about what it means to be an artist and the transcendence of a creator. From the layers of identity a creative being arises. 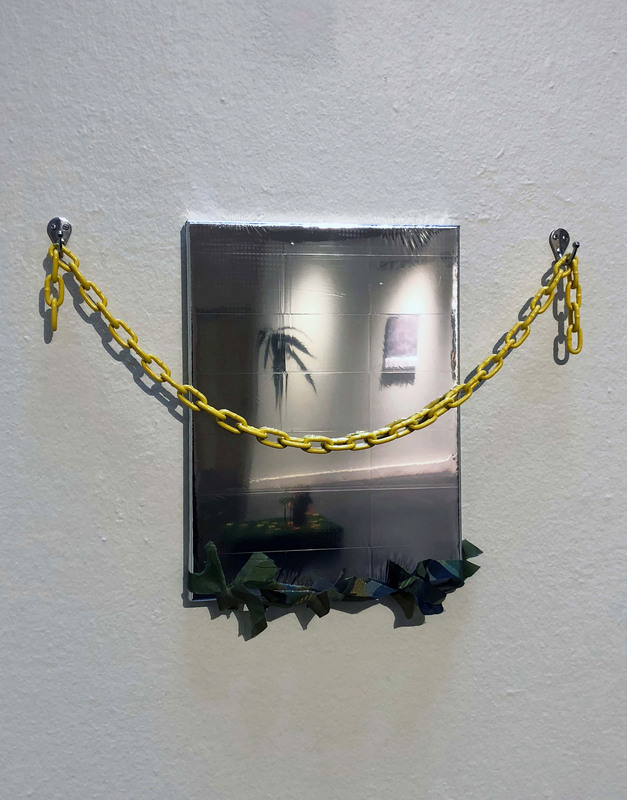 This piece challenges perceptions, such as proposing the questions “whose view is whose?” and “what does it mean to be an artist?” It aims to express a perceptual relationship the artist has with the world, ultimately asking the question who is the one watching and who is the one engaging. The viewer has a lens to experience the duality of the artist and the audience and what it means to possess either perspective. 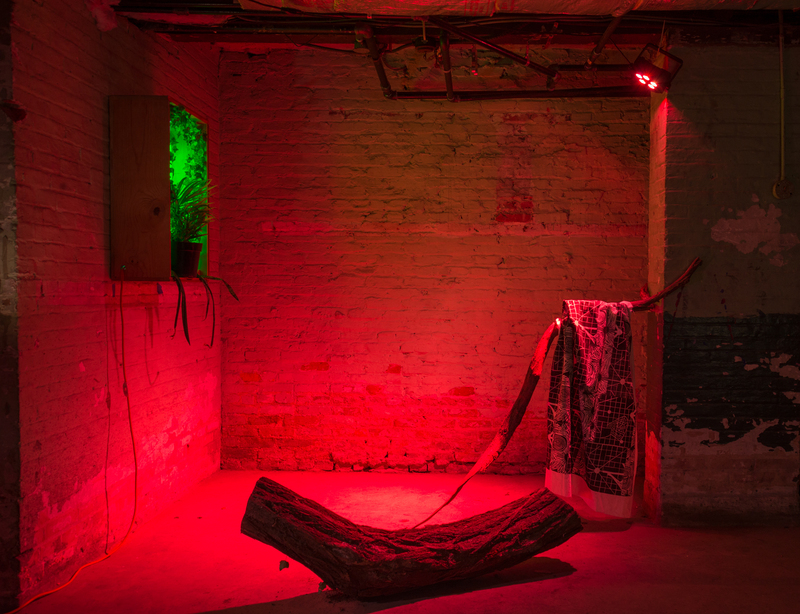 Light and Sound Installation: piano harp, brass rods, cinder blocks, fish line, baby shark, industrial fan, gold leaf, custom color light, and amplifier. This work was originally inspired by a few experiences that took place in Cuzco, Peru with the Andean indigenous community. 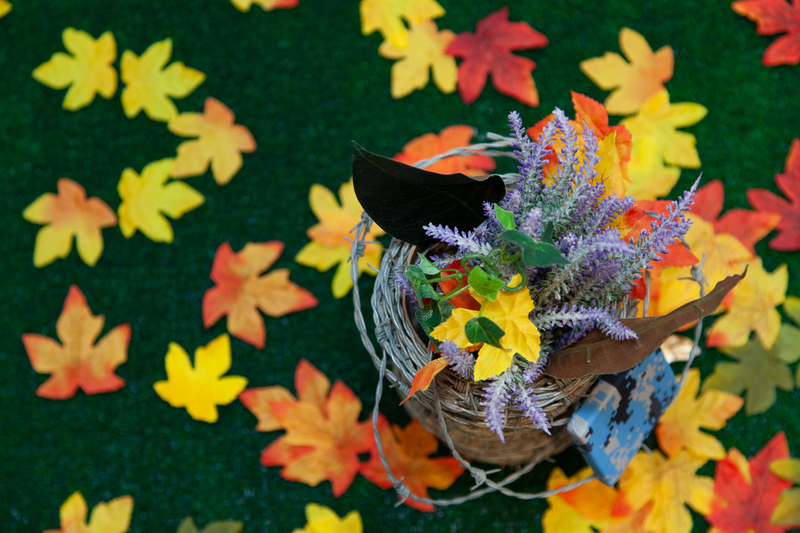 In many Andean traditions, it is common for nature to have an important role in spiritual practices, such as creating offerings with everyday objects as way to honor and thank "La Pachamama" (meaning mother earth in the language of Quechua) and its many gifts such as the elements. Within these practices, it is also recognized that nature has an intelligence and voice of its own. In response, I created this sound and light installation from all found objects as my interpretation of an offering to the wind. This sound piece is also designed to create sound from the use of the fan blowing air towards nails and screws that hit at random instances the different strings of the piano harp installed. Removing the individual the instruments itself and letting the air create its own music.